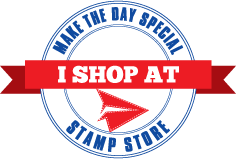 Make The Day Special Stamp Store Blog: The Sunday Strolling, Walking Dead. I used Mama Elephant's Sunday Stroll and Sunday Sentiments to build up my scene as the way the little boy and girl are standing looks just like the way zombies walk haha. I added some scars and scratches to my little characters, and coloured using Distress Inks as watercolour. I added the purple as that kind of smoky ground haze you always get in Zombie films lol. I finished off my sentiment using Mama Elephant's Starry Night set to help make the card make sense...kind of haha. Just go with me on this one, I didn't have any 'Zombie sentiments' lol. This was so much fun to do and really shows how far these gorgeous little character sets can be stretched. I now want to 'Zombify' everything I own...I'm going to spend all of October turning my cute stamps into mean monsters! I really hope you like it. As always, everything is linked below so go make your own monsters!